I absolutely love Chanel quilted bags, which was why I wanted to create a nail art inspired by the quilt design. I didn't go for the classic black, just because I thought it would be more fun with color. At first, I tried to do it with various different colours, but it didn't turn out too well. 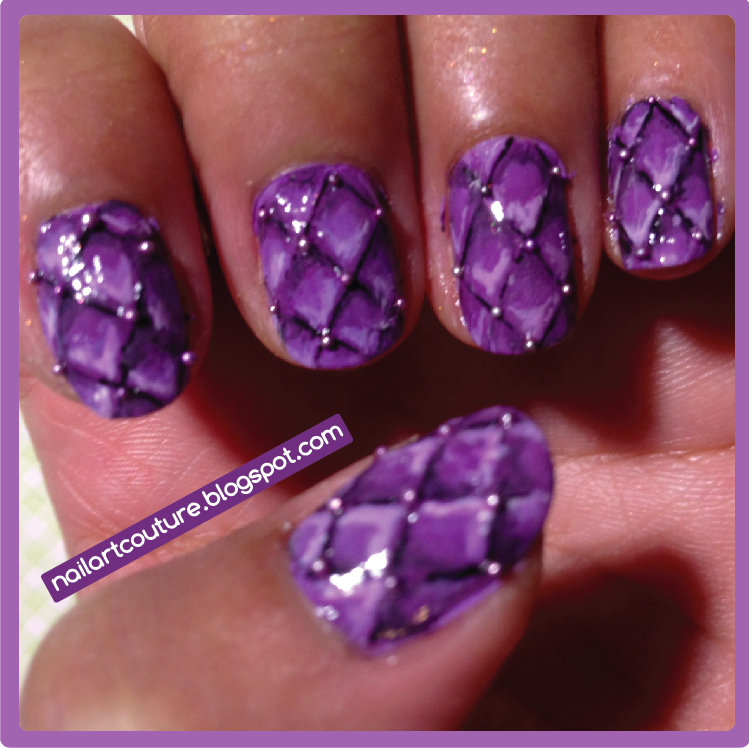 Out of all them, purple looked the best to me so I took the rest of the colours off and did a purple quilted design instead. My goal of this design was to try to make it look 3D by adding the shading. I think it turned out quite well and on top of that it's super easy to do! Keep reading to check out my step to step guide on how I achieved this! Man oh man! This month is going by super duper quick! I recently started a new job and so far I really like it! I think now that I have a routine, time seems to go so much faster. Anyways, since it's almost mid-August, I really want to get a blog post up! 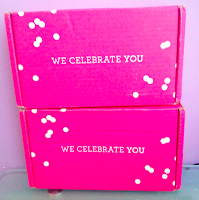 Anyways, I have been receiving my Glossyboxes the past couple month, but I stopped blogging about it. Why? Just because I'm simply unimpressed and I don't think it's worth spending my time to talk about. They give out way too many drug store brands, and I just don't think it's worth the $15. Since I keep forgetting to cancel, I will be expecting an August box (which I paid for) and a September box to finally use up all my Glossydots (right now, I'm 80 points short). Also, Loose Button members will be expecting their first seasonal box! My hopes are up just because Loose Button is capable of wowing us. That I will definitely make time to blog about! 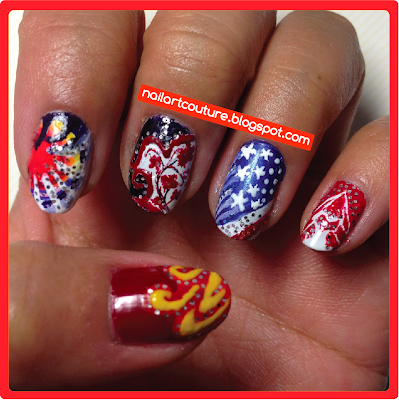 I hope I have time tonight to squeeze in one more Olympic-inspired nail art. I'm thinking uniform inspired! Stay tuned for that. 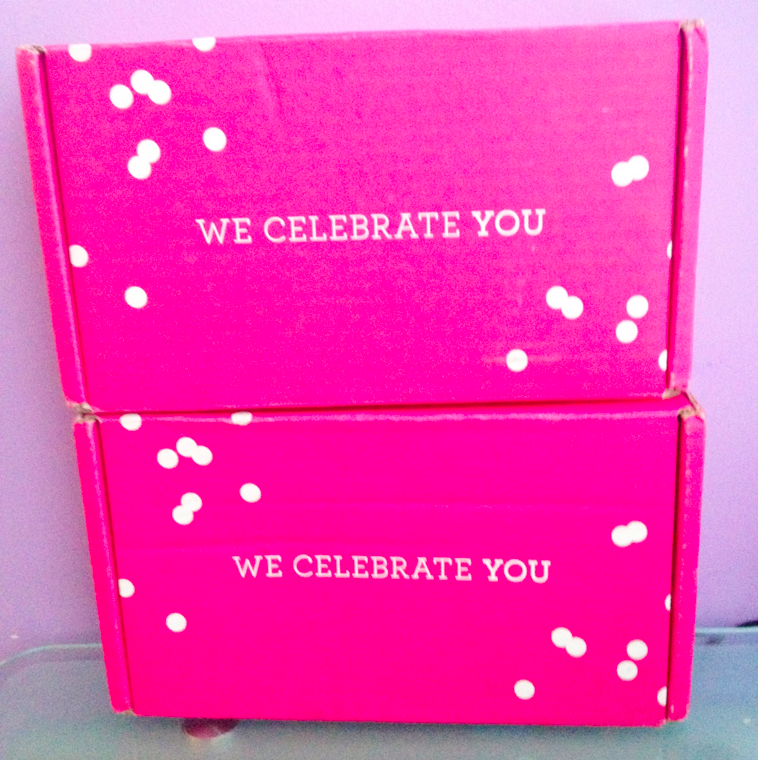 A couple days ago, I received my two Julep Maven boxes! How is it that an AMERICAN company can get their boxes in such a timely manner? 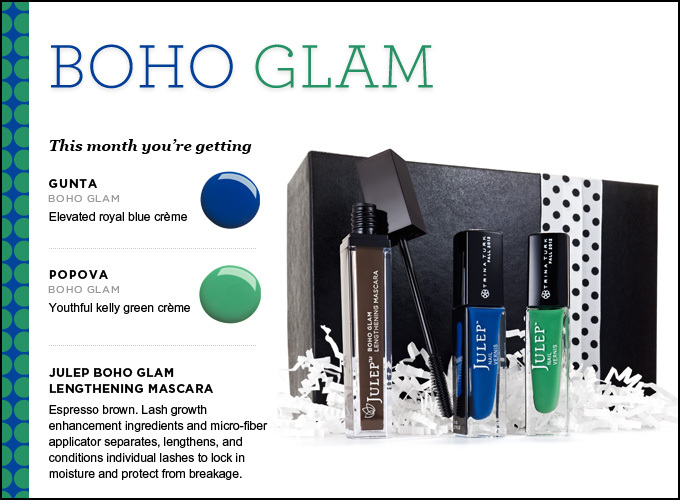 Why can't Canadian company get their boxes to us beginning to mid-month. Sometimes we don't even get it until the next month! 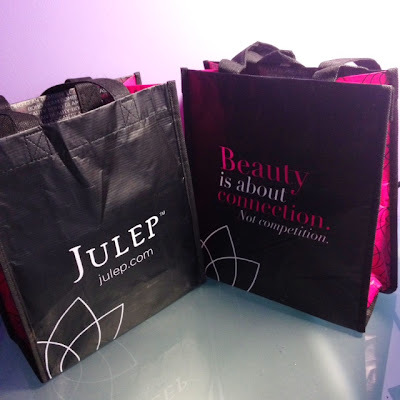 If you're curious about Julep Maven, just go to my Beauty Box Tab for more detailed information! I'm currently helping out my cousin build up her credits, so she would be so appreciative if you signed up through her link: http://www.julep.com/?r=20017515. 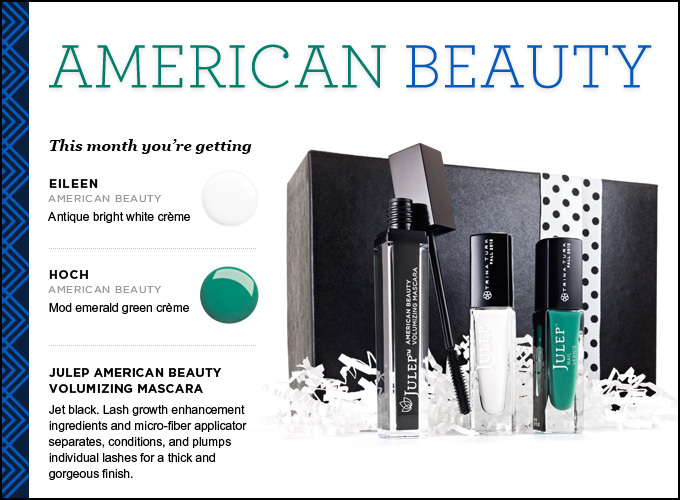 The current promotion is 2 free nail polishes in addition to the two or three polishes that come in the intro box for $9.99. 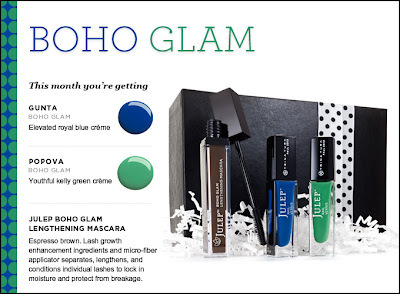 If you're interested, click the link and use the code 2FREE. 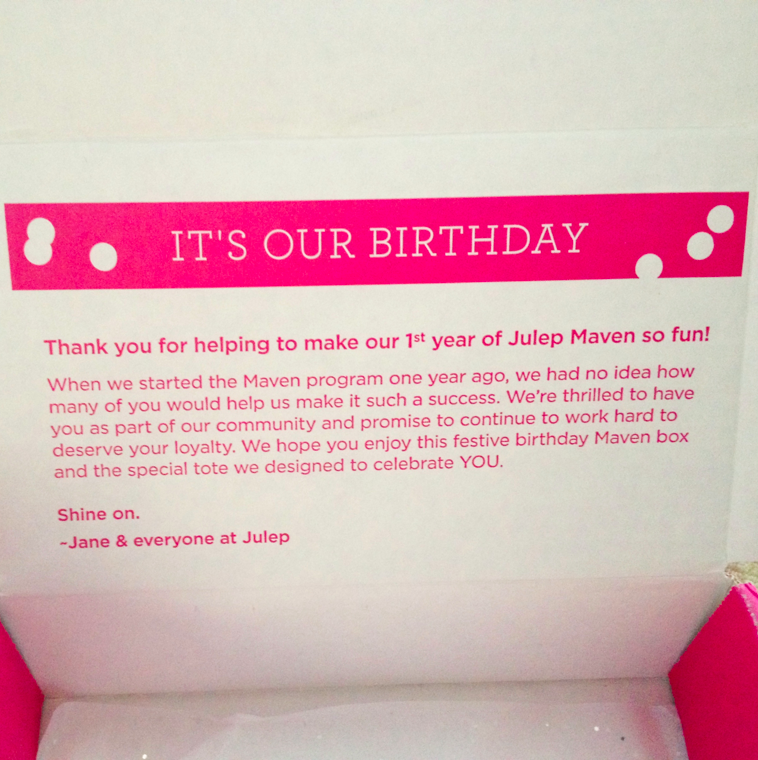 This month Julep celebrated their one year anniversary. 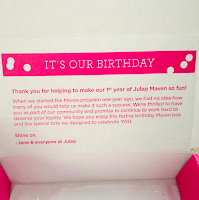 For this special occasion, they hosted a digital party giving out a bunch of free prizes and changed their usual black packaging to pink! They wrapped everything in a white tissue with silver confetti. If you notice, they do fall off rather easily, but try to save them because they make really great nail decor! This month's bonus item was a Julep tote or in a less fancy term, reusable bag. It's a lot smaller than I expected, nonetheless I think it is pretty cute and handy. It's good to stuff in your purchase when you're out to make small purchases. Right now, I am using it as a lunch bag.